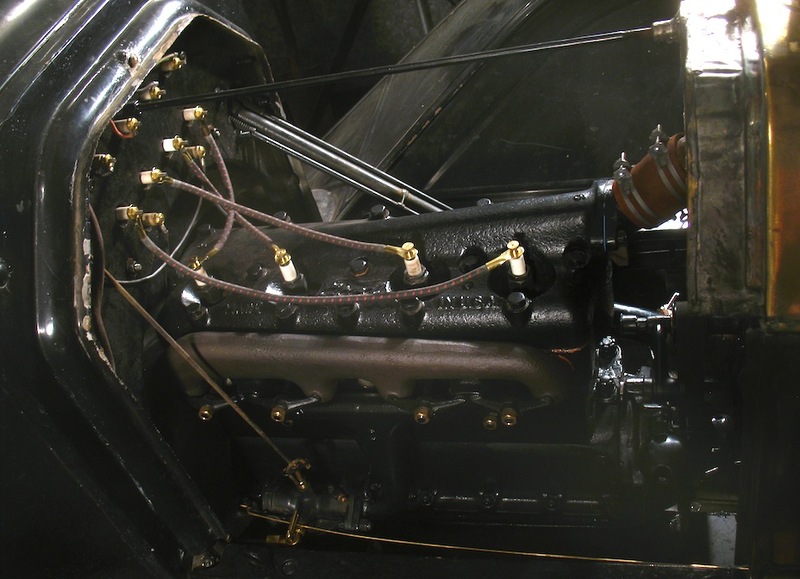 Whats the correct spark plug wire for a 1923 T? I see Yellow with a tracer and Blue with a tracer. I have probably missed it but cant seem to find any info on it. White oak, red oak or black oak? So would that be that yellowish color I see in catalogs and online for their spark plug wires? AH, I found someone that has the Oak color your referring to and bought a set. Thanks much! I thought the brown colored wires were for the earlier cars - up through 1918??? 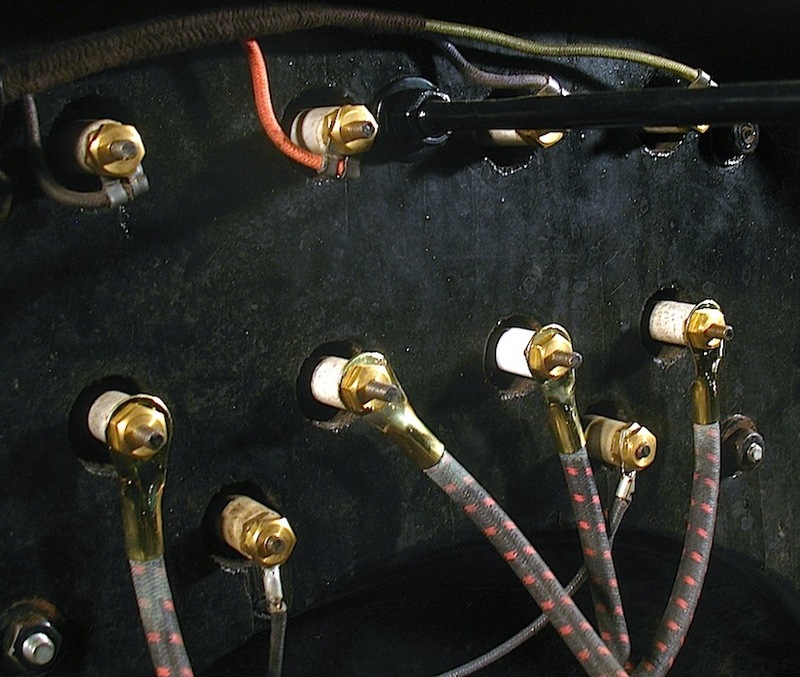 From 1919 - 1925 and also for 26-27 the original wires were black with a red tracer. In either case the orange wires are not correct. David..from what I've been able to find, yes the brown colored wires were for the earlier cars. Replaced mine on the '12, will do the '15 this spring when I drop the new engine in, with the correct color brown. And yep, on the black/red for later. The original spark plug, horn and magneto wires from my unrestored '17 roadster are brown. I also have another original set of brown wires from another '17 in my parts collection. make sure when purchasing your new set of wires that they are soldered on the terminals. Sounds like black oak with a red oak tracer was appropriate for the later cars and chestnut oak for the earlier cars, maybe with a black oak tracer. Looks like Robert's oak color was correct after all. I already did get the set with the soldered on terminals. Now, you guys have me all confused. I ordered the oak with black tracer as above earlier today. So that is not correct for a 23? Lost ball in high weeds now I am. The Macs catalog which many consider a good reference shows the black and red wires as "original style" and the orange and black as "reproduction style". Both statements apply to all years. Not saying the info is correct, just saying. Just to augment the confusion, I'll postulate that nobody knows for sure. The color of all the original wiring has been changed by the passage of ninety or more years. That said, the catalogues list the brown wires for 1909-1918 and the black for 1919-1927. I'm not sure about the brown ones being oak, though. I think they may be hickory. I may be guilty of major gaucherie, but these were in my 1915 when I got it, so I'm letting them stay. I think the Mac's catalogue is a great reference for the pictures. I don't necessarily trust them for information. 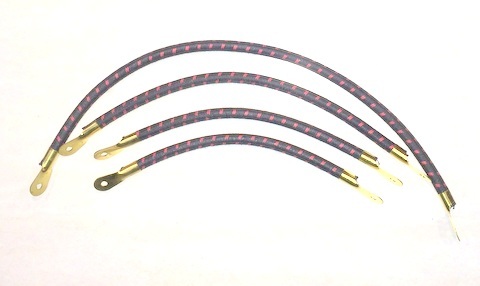 Langs sells the correct wires--brown for 9-18, and black with double red tracer for the newer T's. The yellow with black tracer are pretty, but were never used from the factory. Drats! I may be stuck with the oak/yellow ones then. I found them on ebay and they say they have soldered terminals and thats what made me edge toward getting them since the specified it. I did look in the macs catalog, but forgot about what they said. And forgot to check with langs. Too many venders with too many wires! I reckon my engine will have some pretty bling for a while. Those wires will be fine. The nephew in Tobacco Road bashed his new car into a tree. Surveying the damage, he commented, "It don't hurt the runnin' of it none." Words to live by. If your biggest problem is the color of the spark plug wires, you should sleep well tonight. hahaha!! No its not that big of in issue to loose sleep over, I just wanted to get the right color if I could. I need new wires bad though, they are still the original ones. Or at least look 90 years old! if you just bought them on e-bay ask the seller to swap them out for the other colors out (Black with the red tracer) before he ships them out in the mail. I like those red one's Wes!! Nothing like yankee ingenuity! Ill see if he has the black. I do not remember seeing that color listed. What is wrong with the Twizzlers wires? They look nice and shiny! In restoring my 21 Touring I used a set of the oak, orange color wires I had gotten somewhere years ago. Saved a few bucks and used them. Correct? They work fine and staying on. I'll go along with Steve Jelf on no one knows for sure. 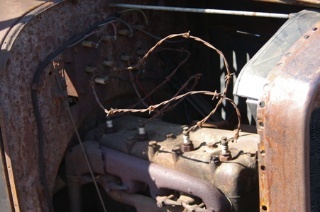 I've seen old stock wires at swapmeets for years, that are brown, but who knows if they are real Ford wires? 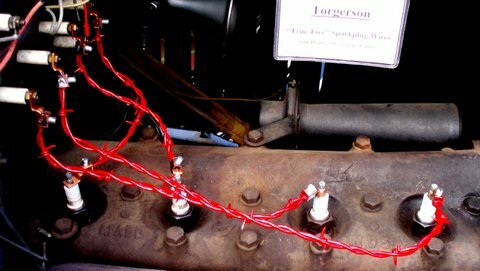 I've always made my own from Ford V-8 wires made in the '30s, and they look old too, but are not the right coding. I have some NOS '26-7 wires, and they are a dark color with a tracer, but don't know the color at the moment. I always cut the terminals off the old original wires so I can reuse them at a later date. If your changing the wires that means that there not orig. right? You will always have someone question what you've done. On my 27 coupe, I have plain black spark plug wires. They were made with excess wire leftover from the Tractor Supply kit I bought for my M Farmall. The terminals are original Ford. My wires are original, its just there about gone now. Fewer strands of wire on the lugs and the insulation is hard and brittle. I guess if you think about it, its probably better with the black ones anyway. The only bright and shiny new thing on my T will be the spark plug wires! Got my new wires today! They look great and I cant wait to get them installed! I have the original wire drawings for the early cars and there is no color called out at all. I don't think anyone can prove one way or the other. I think however that lacquered (shiny) wire may not be authentic for early car since lacquer wasn't around during that time. My opinion is that the wire was just cloth covered and likely dull on the outside. Any coloring on such wiring would be so badly faded by now that it would be near impossible to prove what color it was. If anyone has an original 1909-1912 wire I would welcome their posting a picture of it. Thanks for the comments John. That is exactly how I feel. Once upon a time I repaired a 1934 Wurlitzer juke box that had a wiring harness that someone had cut. Attempting to figure out which wire went to which, I found when I started soldering that the heat melted something on the old cloth insulation and brought the color right out, tracer and all.